I first saw the orchid genus Satyrium in the Drakensburg mountains. I had never heard of it before and soon forgot about it, until last year when its name cropped up in the unlikely pages of the Glendoick catalogue of Cox Rhododendrons. The species offered for sale was Satyrium nepalense. I obtained a tuber and planted it outdoors in the autumn of 2005 in a sheltered spot which stlll got light and sun. I used about equal portions of crushed bark and coarse grit to provide some moisture retention in good drainage. The first signs of of life appeared in June of this year and the plant matured and flowered in August. 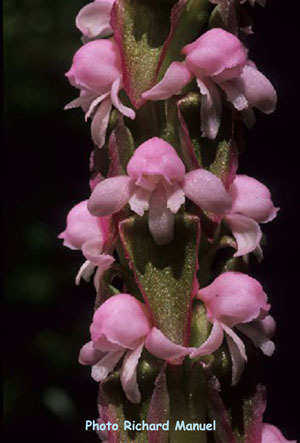 It is slim and tiny, 5" -6" tall, with delicate pink florets growing tight to the single stem. Seen through a close-up macro lens it looks dramatic, but is almost insignificant to the casual glance. I am eagerly looking forward to next year to see if it spreads, or develops, or even survives!